Is a low-glycemic food (35), which provides sweetness without the crash and burn of refined white or brown sugar. Carmelizes when baking, unlike stevia or agave, making it an excellent replacement for refined sugar in baked goods. Is often (or usually) sustainably harvested, making it an eco-friendly choice. Is high in amino acids, minerals, and B vitamins! So, when my local organic market had coconut sugar on sale, I couldn’t resist and picked up a bag. 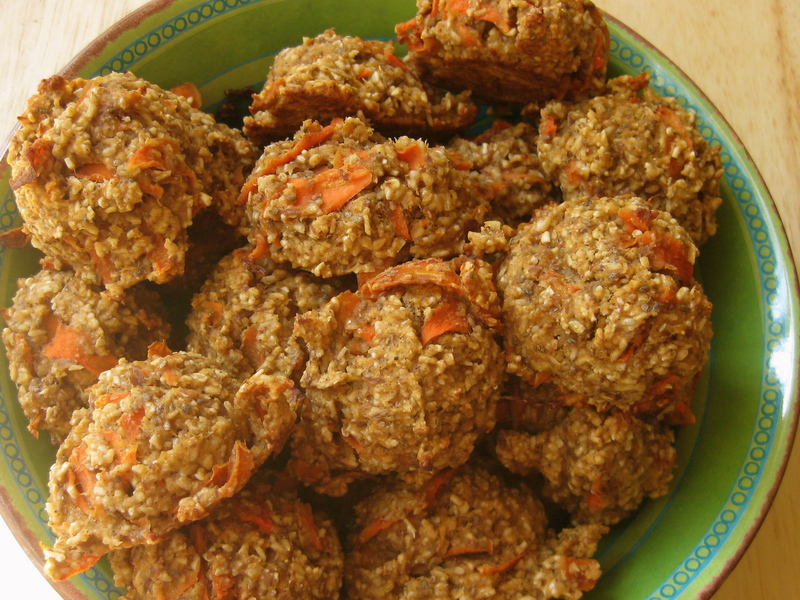 I was also eager to get rid of some extra carrots, so decided on one of my favorite old recipes: Carrot Breakfast Cookies! They taste delicious in the morning! They’re filling ~ two or three with some almond butter is plenty for a small breakfast (for me). They’re very low in fat and cholesterol-free! They provide fiber and protein to keep you fueled-up for several hours. 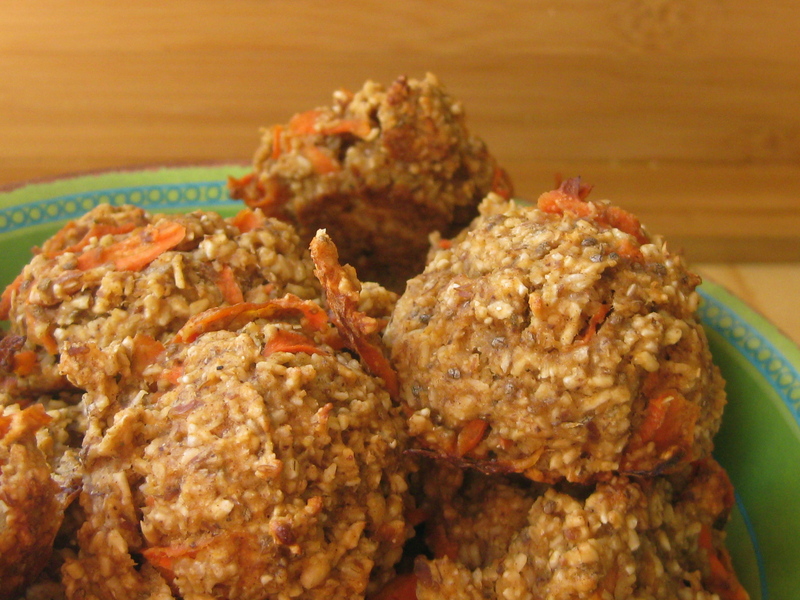 They’re extra-yummy when topped with raw almond butter. The coconut/palm sugar worked as I’d hoped and was a delicious replacement for refined sugar! I made these with garbanzo (chickpea) flour, but you could try whole-wheat flour or any gluten-free flour. 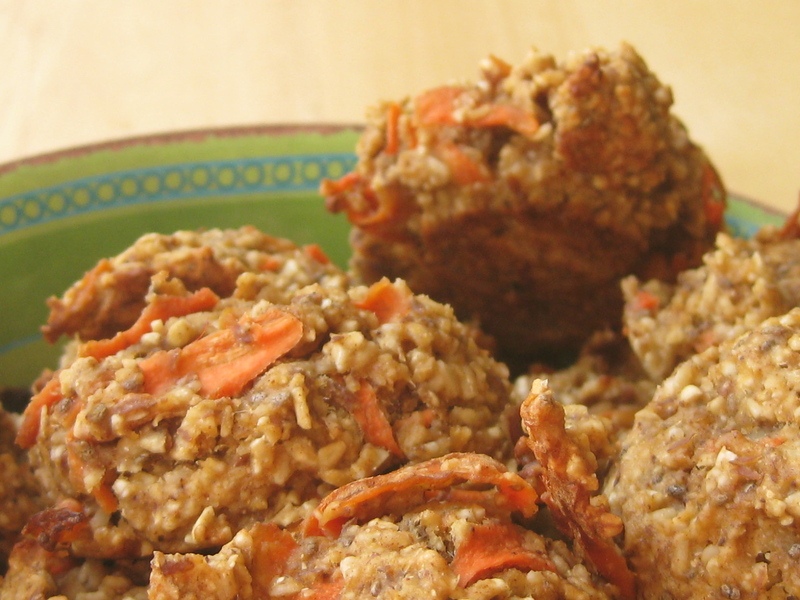 You can also make these with eggs instead of egg replacer, but I like the extra healthy boost from chia. Make your chia egg replacer and let sit while you prepare the rest. Sift together all the dry ingredients in a medium-sized bowl. In a separate bowl, mix the applesauce and palm sugar. Add the chia egg replacer. With a wooden spoon, mix in the carrots. Fold in the dry ingredients until fully incorporated. Spoon out in 1″ balls and flatten slightly or leave puffy (like I did) for more muffin-y cookies. Bake at 375F for 15 minutes. Enjoy! Have you ever cooked with coconut/palm sugar? Yep, love both coconut and palm sugar. Just bought unrefined dried cane juice yesterday for the first time and am eager to try it out. I’ve used palm sugar two ways, once in a cake( great for grating into drinks, Thai curries etc) and once in a liquid form in a jar, palm nectar I think it is. Anyway the jarred stuff seemed to ferment a bit but I used all of it and it didn’t negatively affect the raw food preparation in anyway. Great post! Interesting! I’m curious about the jarred nectar ~ sounds like it would work well for raw energy bars. Thanks for stopping by! I’ve never tried coconut/palm sugar but now I’m intrigued!!! I like that it’s a low GI food. What is the sweetness/taste factor like? It’s sweet and tasty! It’s not as “bright” tasting as refined cane sugar, slightly mellower, but I’ve found it to be perfect for baking or as any other dry replacement (though I love my stevia, too!). I’ve never tried coconut sugar before, but I’m going to keep my eye out for it now. I’ve tried agave, honey, sorghum, and various sugars, like turbinando, with some success. These look interesting! Stupid question… Should the steel cut oats be cooked first? Nope, uncooked 🙂 Hope they work out well for you! 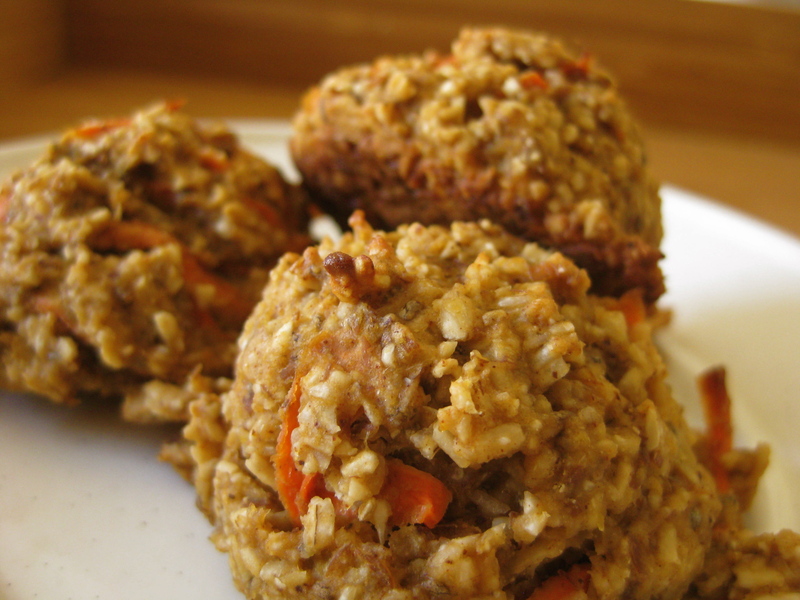 Pingback: Carrot Breakfast Cookies | Thank You Alexa!